I just watched the video of Betsey's runway collection. All I can say is, "Wow!" What fun! Her clothes are full of LIFE, and the people who wear them are not afraid to be themselves and express themselves through their fashion. I would love the chance to meet Ms. Betsey Johnson - a woman who embodies the spirit of her designs and inspires others to do the same. I recently started a style blog (http://lwu81.blogspot.com) to document my own forays into figuring out how I want to express myself through fashion. It would be a treat learn more about what inspires her - the inspirer! And guess what?! I did learn what inspired her most recent collection!! So now you get a sneak peak into today's exclusive event and my brief encounter with the lovely, passionate and positive Betsey Johnson! And, I did decide to let out my inner fashion nerd just a little. Of course when I got to Betsey Johnson, I realized I was a bit under dressed. HA! I heard that many of the store employees are also members of a burlesque troop in Seattle. [Thanks to Burlesque Seattle Press for letting me know the troupe is called the Atomic Bombshells]. And they led the party dancing in the store windows to the DJ's party music. Look! It's me feeling awkwardly under dressed with the dancers, lol. Can you spy the Anthro? There were cupcakes and mimosas aplenty. Guests were treated to manicures by Julep and makeovers by Benefit cosmetics. Everyone was dressed to the nines! I was immediately jealous of all the fun JOYOUS frilly frocks the store employees and VIP guests had on. It's been quite awhile since I've been surrounded by people who have such a passion for fashion. I love the humour in this outfit. Sometimes we take ourselves way too seriously, and this just reminds you to laugh! Of course Yelp's Seattle community manager, Katy H., and another yelper (whose name eludes me...) were in the know and dressed in some of Ms. Johnson's finest. BTW, doesn't the blue dress on the right remind you of Anthropologie's Sunrise & Midnight dress? Betsey Johnson even has a dress like this in a similar colorway. Anyway, this unnamed yelper gave us a hot tip that every year during the fourth of July weekend, Betsey Johnson stores across the country have a buy-one-dress-get-one-dress free offer (including sale dresses!). She says the sale isn't ever advertised, so you have to be "in the know." Well, now you KNOW! omg squeeeeeee! oh yah, and I'm a little shiny from the Benefit makeover that was supposed to "brighten and tighten"
So what inspired Betsey Johnson's Spring 2010 RTW fashion show [images from Style.com]? Whew! Sorry for the long post! Thanks so much to Betsey Johnson, Yelp (especially Katy H.! ), Julep, Benefit, Trophy cupcakes, and Von Reuss cosmetics (who included a sneak peak of their new 2011 cosmetics line in the swag bag)! OMG THAT IS FREAKING COOL! ok I will chill on the caps, but how amazing must that experience have been! You looked like you had such a blast, and I think your outfit was great, the full skirt fit great in with all the ones there. Very very cool :D Did you see anything there that you liked clothing wise? Amazing!! That sounds like it was so much fun and you looked great!! it must have been one heluva experience. Your glasses are so geek-chic, you look the part. Betsey Johnson kinda reminds me of our Australian Alannah Hill. Both are very "out there" in a girlish, lady-like way! Hey you look like you had fun! So awesome! Your outfit is adorable too. GAH! I couldn't go in because I had to get back to work. Looks like it was a blast, and you look great in the window! Thanks for the BSPress link. I'll be following your adventures. Forgot to tell you to check out Jamie Von Stratton Design...she was one of the dancers and she makes super fun clothes too. Wow, that looks like so much fun! Thanks for posting all the awesome pictures. OMG, that is AWESOME!!!! You and Betsey look like BFFs. So jealous. It looks like it was so much fun!! Lucky GIRL! Thanks for letting us know about the sale! I'll definitely be checking it out from now on. How awesome and fun! You look adorable in that first pic - I love it! Thanks for sharing! @Jess it was crazy fun, and I still can't believe I got to go! I did end up buying a dress (on super sale!) - a portion of the proceeds goes to breast cancer research. They are shipping the dress to me though, since they only had a size 6 in the store, and I needed a 4. @Matt IKR? It's a great phrase to know, because it reminds you to take a different perspective on everyday problems. @Cindy Thanks so much! It was very awesome and I still can't believe I got to go. @Vintageglammz I hadn't heard of Alannah Hill before, but I just looked up her clothes online, and I agree! @LilMissSeamstress I know! I was pretty much in disbelief all day that I got to go! I'm just glad I got to share some of the day with people! @Meg & @Lisa thanks so much! I'm glad my outfit ended up semi-fitting the event (even if it wasn't quite up to the exuberance level of everyone else's clothes). @Jessica Thanks for the tip on the burlesque group! I will look up Jamie Von Stratton Design! @Mich geeky glasses are completely fun! 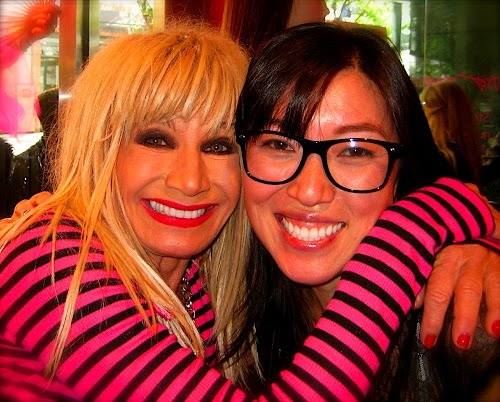 @Elaine Betsey Johnson is so personable (and probably so used to taking awesome pics with fans)! She just sidles up for pics! you are so lucky and i love your recap! and i love that you just love to be in photos. there are thousands and thousands of photos of me making funny faces... most don't make it to the blog but i never shy away from a photo op! and i love your outfit. so happy that you got to meet a fashion legend!